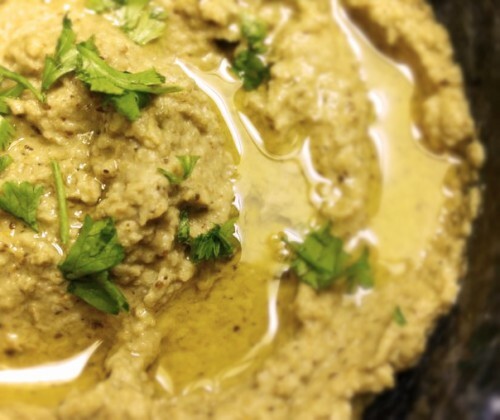 Baba Ghanoush: Eggplant has a wonderful mild flavour and is an extremely versatile vegetable used all over the world. Baba ghanoush is Lebanese in origin and is generally served as an appetiser or side dish and very similar to hummus. 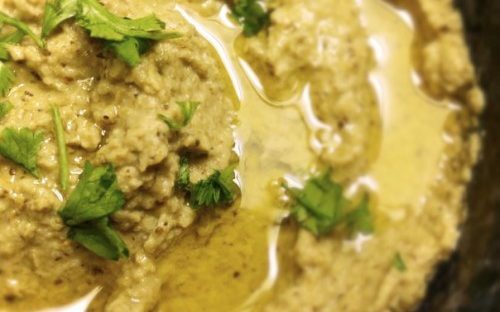 The name ‘Baba ghanoush‘ comes form the Arabic phrase ‘baba gannuj‘, in which ‘baba‘ means ‘father‘ or ‘daddy‘ and ‘gannuj‘ means pampered. According to Middle Eastern food lore, it alludes to an elderly, toothless father – or baba – whose daughter had to mash his food because he wasn’t able to chew it. 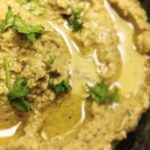 Baba ghanoush is essentially a basic recipe that has been transformed in family kitchens and all over the world, so feel free to adjust the recipe to suit your families tastes. Place the eggplant on a baking sheet and prick the surface of each one several times with a fork. Bake for 25 – 30 minutes or until very tender and the skin begins to shrivel and turn dark. Remove from the oven and set aside to cool. When cooled, peel the skin of the eggplant and remove the flesh into a mixing bowl then mash the eggplant using a fork. Stir in the oil, parsley, lemon juice, zest and hummus then check the seasoning before adding the salt and pepper (if you want a smoother consistency, you can run it through a blender or food processor). Transfer to a serving dish and drizzle with a little olive oil and sprinkle with more fresh parsley. Cover and chill for up to 30 minutes before serving.